You’re never too old to play with toy cars, especially one that combines a childhood passion with a current passion, and especially one that provides the joy of building it first! Having spent five minutes assembling and another five minutes playing testing, I wrenched myself back to the adult job at hand and the very reason this car exists. 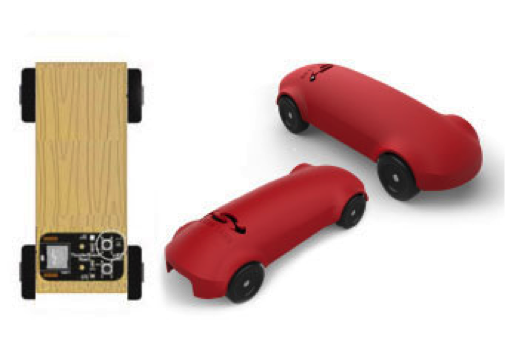 The Thunderboard React Derby Car seeks to plug fundamental knowledge gaps around IoT, all while demonstrating exactly how simple realizing the promises of the IoT revolution can be. To the IoT-illiterate, it demonstrates precisely what we’re all so excited about. For those well-read in IoT but without the exposure to something actually doing something, it offers a visualization of what can be achieved, easily and cheaply – with monitoring and control instantly from your smartphone. 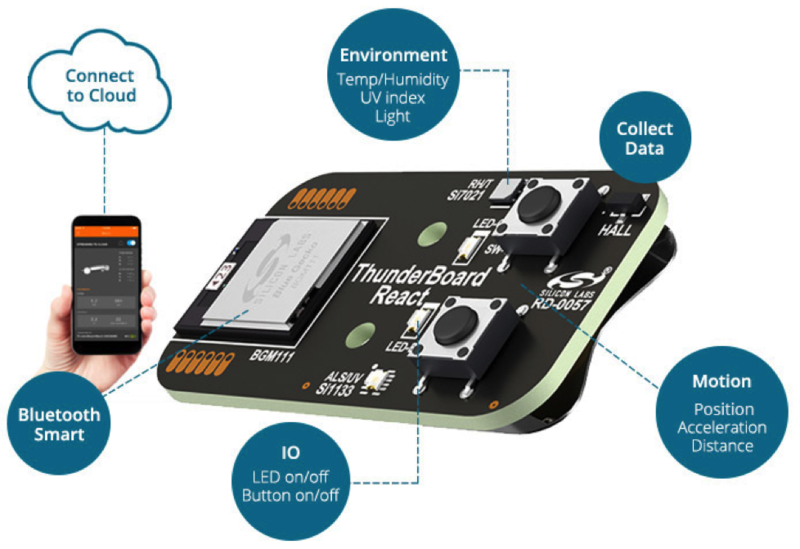 “Under the hood” the Thunderboard React PCB employs Silicon Labs’ Blue Gecko BGM-111, itself employing an ARM Cortex-M4 paired with integrated Bluetooth Smart. Cleverly combining a UV Index/ambient light sensor (Si1133), humidity/temperature sensor (Si7021), Hall-effect magnetic sensor and a six-axis combined gyro/accelerometer, there’s apparently little the vehicle cannot tell us about itself. With even the slightest movements the accurate sensors were updating my smartphone with near zero lag. I was most impressed with the live 3D visualization of the Thunderboard React PCB, showing explicitly its current orientation. However, my bench testing felt a little artificial, a little contrived. So I presented it to an individual thankfully still void of conscious manipulation who would gift me more natural data to review – my 18 month old son. Beyond it being quickly evident that the Thunderboard React Derby Car is far less ruggedized than the devices the underlying technology will invariably end up in, it was fascinating monitoring the sensor outputs in real-time as he obliviously played. As observable above, our current British heatwave has translated to interior temperatures near 90°F in complete shade, proven by a zero UV Index, while humidity and ambient light were within expected levels. By combining recorded revolutions, a ruler, and pi, I ascertain it travelled just short of 133 meters while in his possession. I also established that, in his enthusiastic hands, it experienced G forces jet fighter pilots would be proud of. While it’s true that the subject is far too young to inspire with the IoT revolution, we should be using demonstration platforms like these to inspire that next generation of engineers into our industry. In my opinion, IoT will be responsible for the biggest growth this sector has ever seen, driving embedded into mainstream for the first time. To those not yet enamored with IoT, to me this is the perfect platform to convert them. For those already smitten, it proves just how much one can achieve now with so few components and such a tiny power footprint. Following hours of intensive playing reviewing, there is a 75 percent charge remaining on its CR2032 – a coin cell battery we could only ever really use to power a basic real time clock.